I know, aren’t they cute! 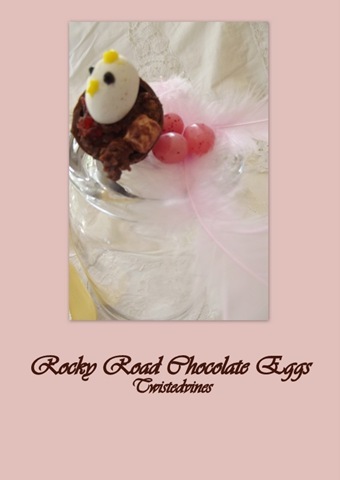 And great fun to make for the children as a special Easter chickadee treat! 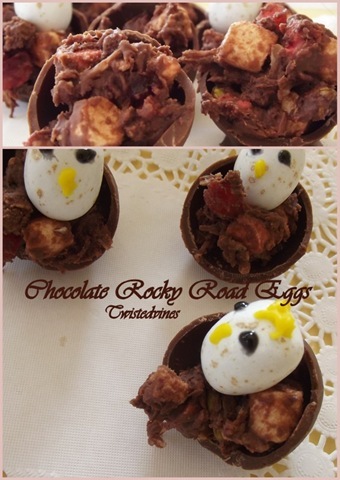 Chocolate eggs filled with delicious home made rocky road.Chocolate,marshmallows,nuts and glazed cherries. 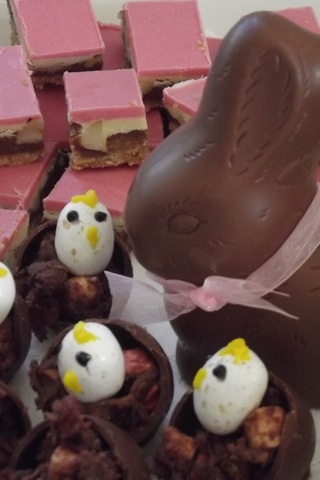 Firstly gently cut the chocolate Easter eggs in half. If eggs break put aside for the melting process. Melt 50g of milk chocolate, working quickly, place a dollop of chocolate on baking paper on a tray, place the half chocolate cup into the chocolate making a base for the chocolate cup. Refrigerate chocolate cups until mixture is ready. 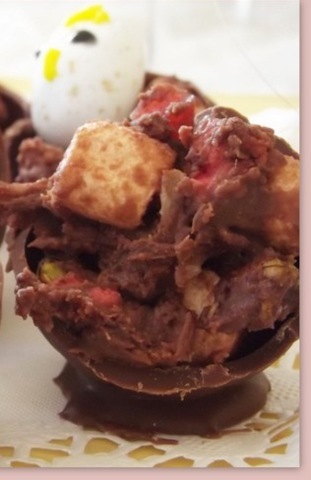 Melt the remaining chocolate in a bowl over boiling water on a medium heat, add the cherry ripe bars, and when melted stir in the rest of the ingredients: mini marshmallows, chopped glazed cherries, pistachios and shredded coconut. 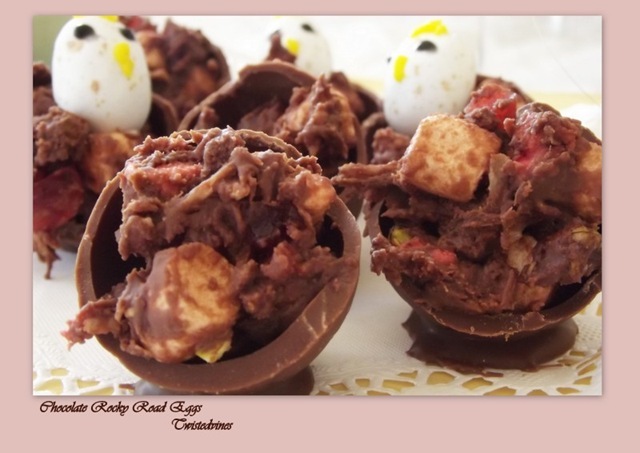 Scoop the mixture into chocolate cups and refrigerate until ready to serve. 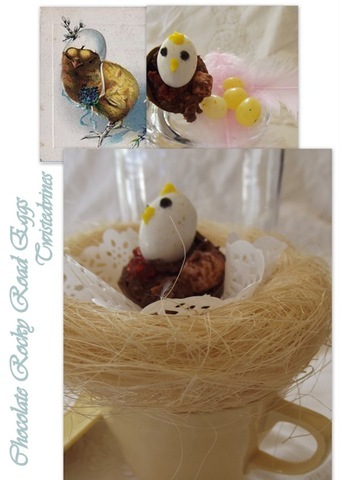 Decorate with Easter egg chickens. 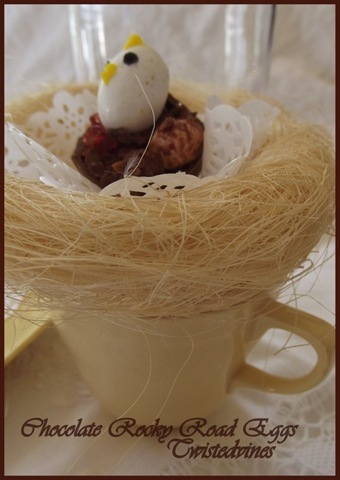 A special Easter chocolate treat. These are SO cute Yvette and tasty. Very sweet, Yvette. Looks like the Easter bunny’s going to be jealous. Your work is peice of Art. It deserves the full credit. What fun, Yvette! And I bet they taste oh, so very yummy, too! What are cherry ripe bars? Cherry Ripe bars are rich Old Gold Cadbury chocolate, with a moist coconut and cherry filling. What a sweet little recipe! I love your pictures of your great creation! I don’t know what those little pink squares are in one of the photos, but they sure look awesome, too!! 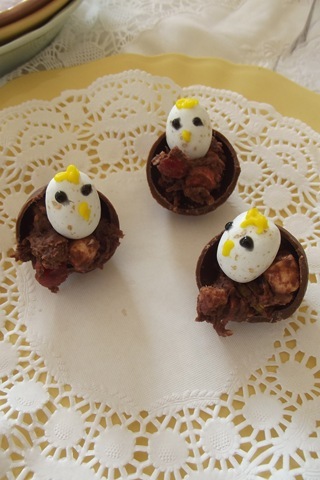 Hi, Brenda, they were lots of fun to make, we had an adults morning tea to do, and we also wanted to make it fun for Easter!